Our Tactical Response Teams (TRT) are a valuable and supportive response resource that provides assistance to our regular SIA security and stewarding teams; in a multitude of eventualities including incident management, public order, medical incidents and crime scene management. The value of our TRT officers is essential to any deployment, providing multi-skilled officers with specialist equipment to rapidly respond to any given incident. The Tactical Response Team provide additional support and reassurance to each of our deployments, enhancing our resilience. 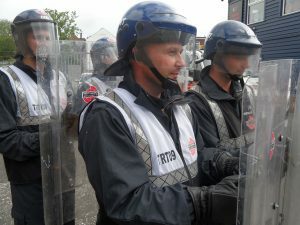 Depending on potential issues for an event, our officers can be uniformed specifically for their multi-skilled duties, equipped with additional body armour and protective equipment including flame retardant coveralls, helmets and shields. Teams will also have access to carrier vehicles to transport themselves and their equipment. Our Tactical Response Teams provides part of our specialist operations deployments, supporting challenging security requirements and law enforcement assignments. Click HERE to view our Tactical Aid & Specialist Operations service. Right Guard Security is an ACS approved contractor for Door Supervision services; meeting British Standards BS 7960:2016 and a member of the UK Crowd Management Association.